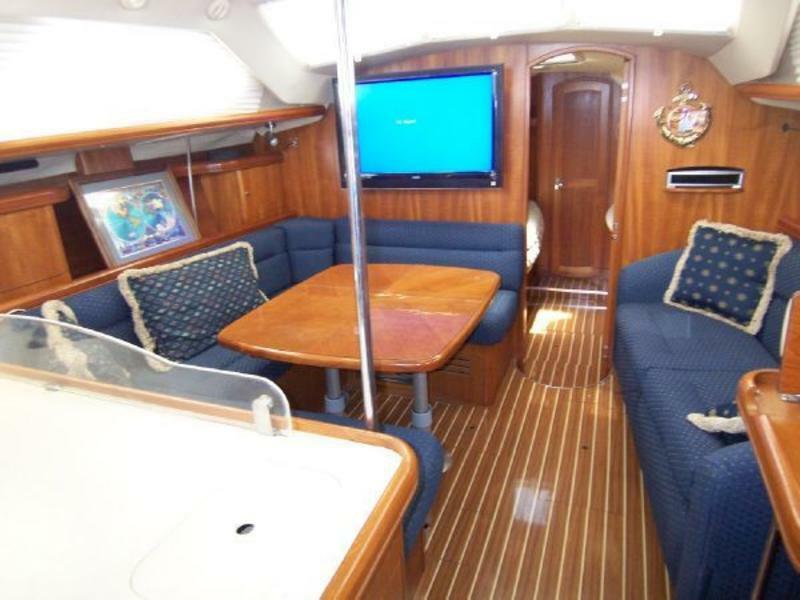 Above and below decks the Hunter 41 Deck Salon has been designed to maximize your comfort, safety and enjoyment. 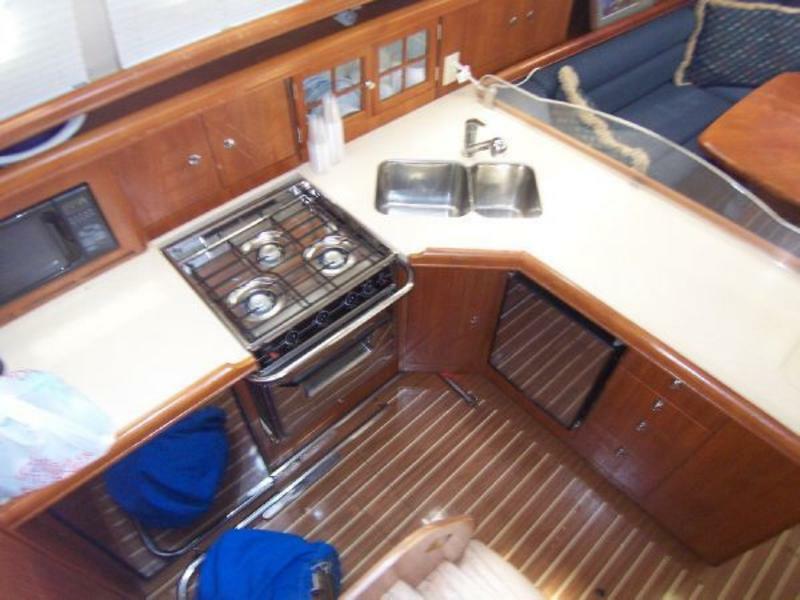 Above decks she features a large cockpit with walk-thru transom, stern rail seats, high coamings, built-in cockpit table and loads of storage. 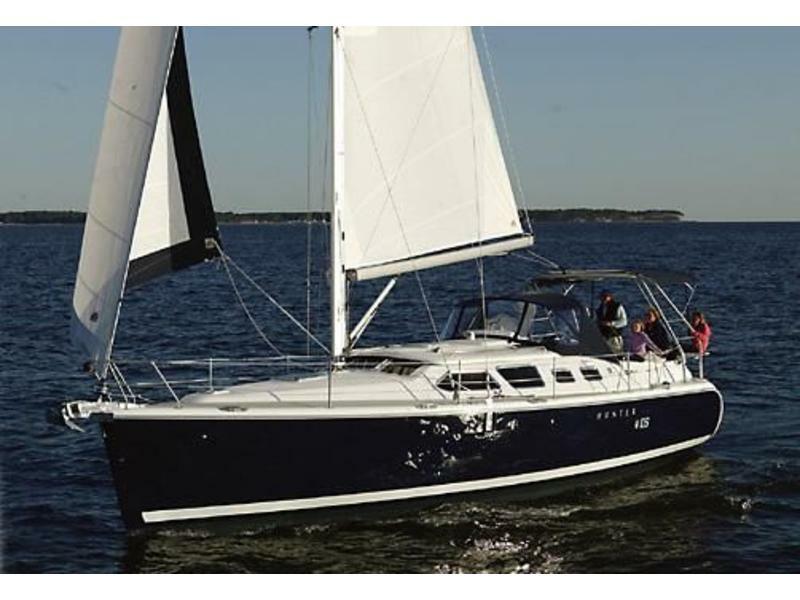 The stainless steel arch provides the perfect placement for the mainsheet traveler as well as cockpit lights and bimini support. 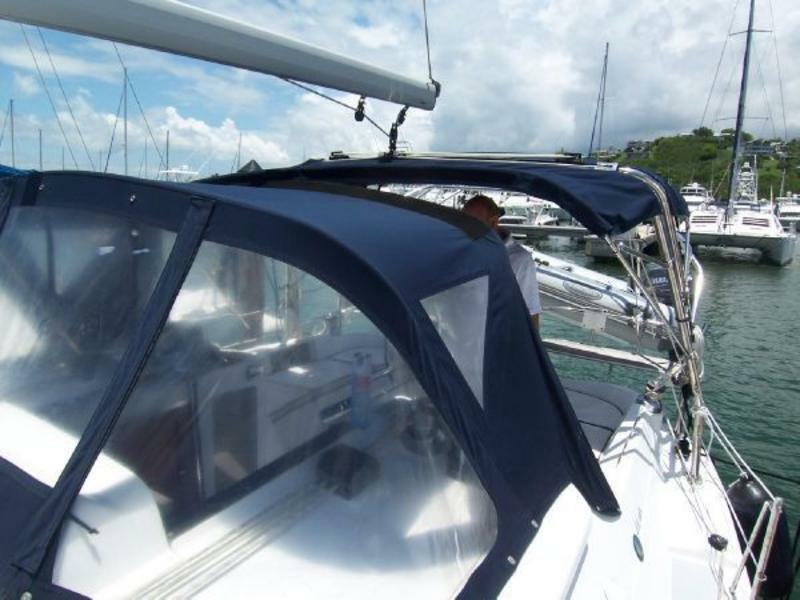 All line are led aft to coach roof mounted sheet stoppers and self tailing sheet winches and built-in halyard storage bins. 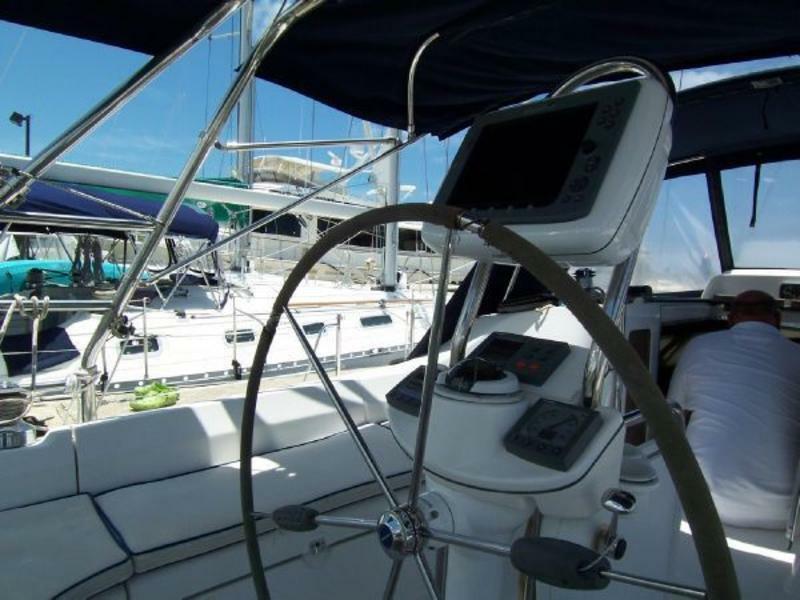 Going fore and aft is safe and easy via the wide side decks with inboard shrouds and tall life lines. 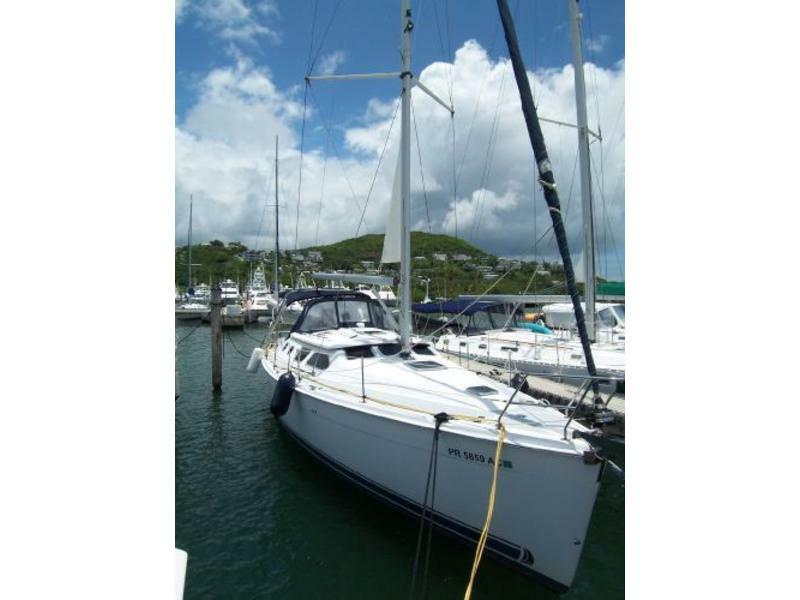 Forward is a large anchor locker with electric windlass, and bow roller. 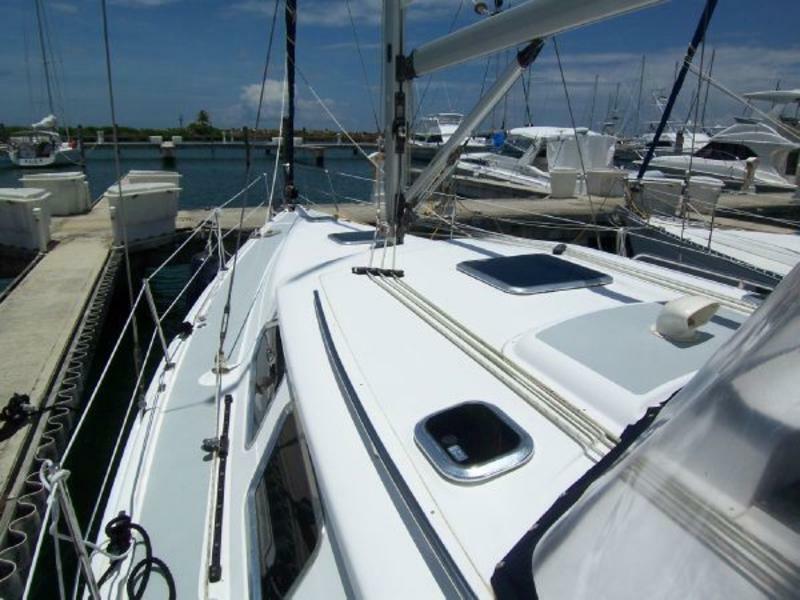 The fore deck is clean and open and offers extra room for lounging and sunning. Midship cleats and midship lifeline gates make docking a breeze. Below decks the 41 Deck Salon begins to set herself apart from the competition. The Deck Salon feature creates a very open, airy feel. Tall side windows and Hunter “Windshield” keep the cabin bright with natural light even on the rainy days. 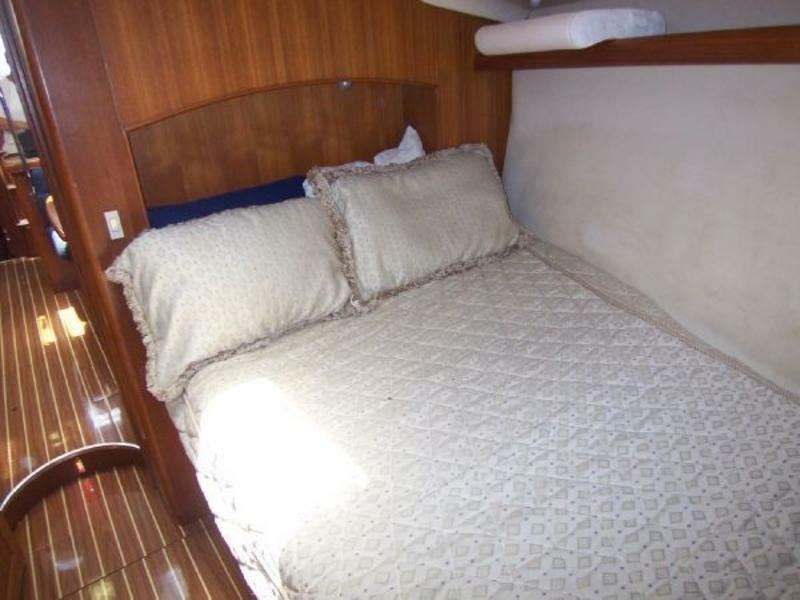 Wind Dreamer II is the 2 cabin version featuring two private staterooms and 2 private heads.The aft suite features a full double, athwart ships berth, hanging lockers, storage cabinet and standing headroom. 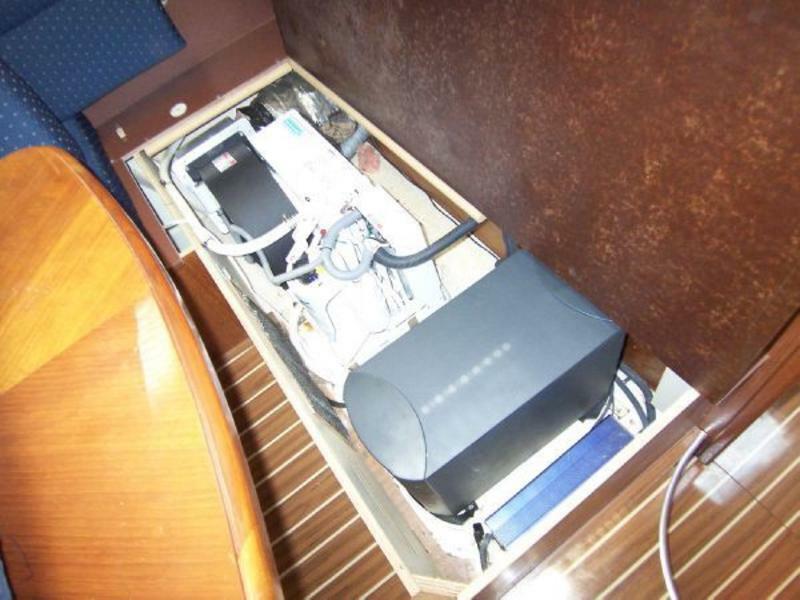 It also features a private entrance to the aft head. The forward suite features a double pullman style berth, vanity. In the fore peak is a shower stall and marine head. 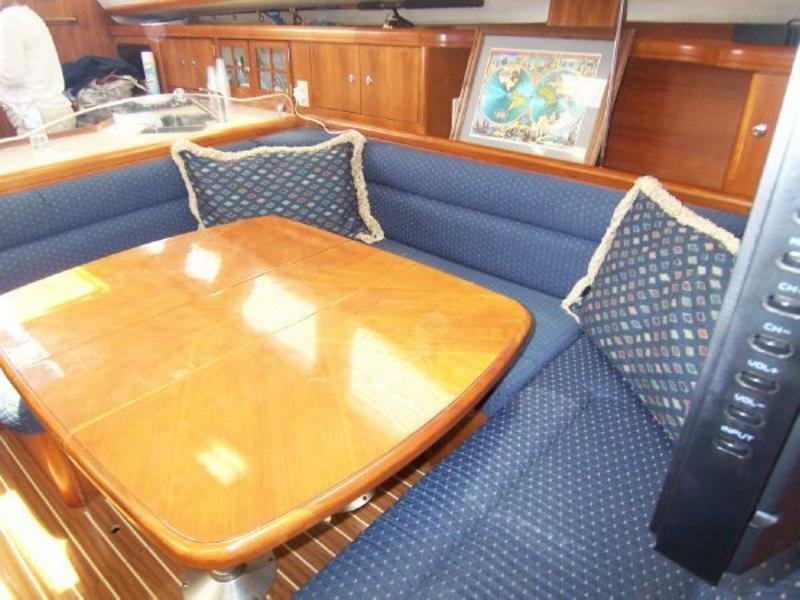 The salon features a large “U” Shaped Settee with Convertible Dinette on port a sofa style bench settee on starboard. 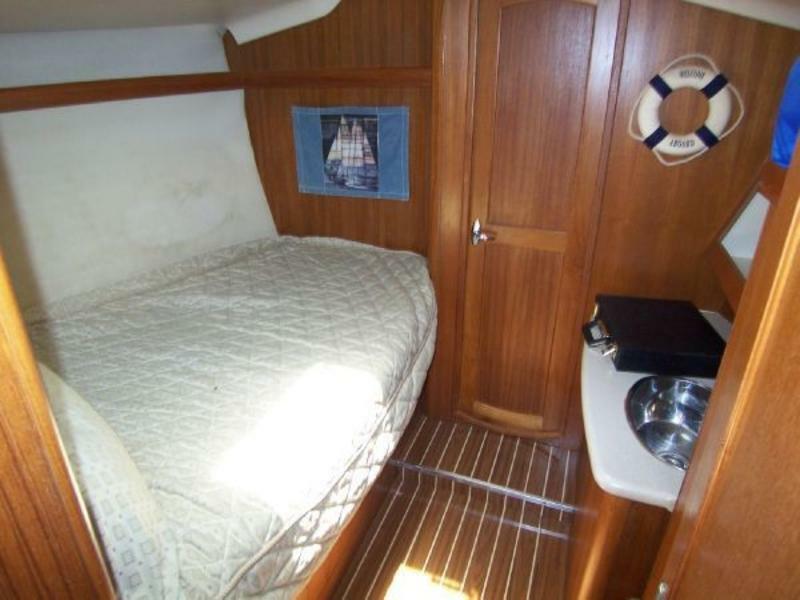 The cruising galley is aft on the port side and offers all the amenities needed for life aboard included a large pantry. 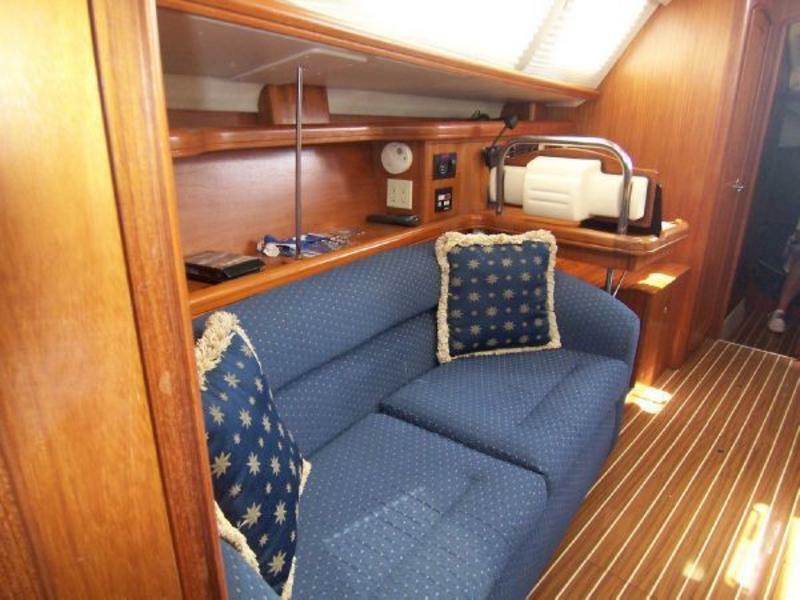 A full navigation station is opposite the galley and features a nav desk with built-in bench seat. 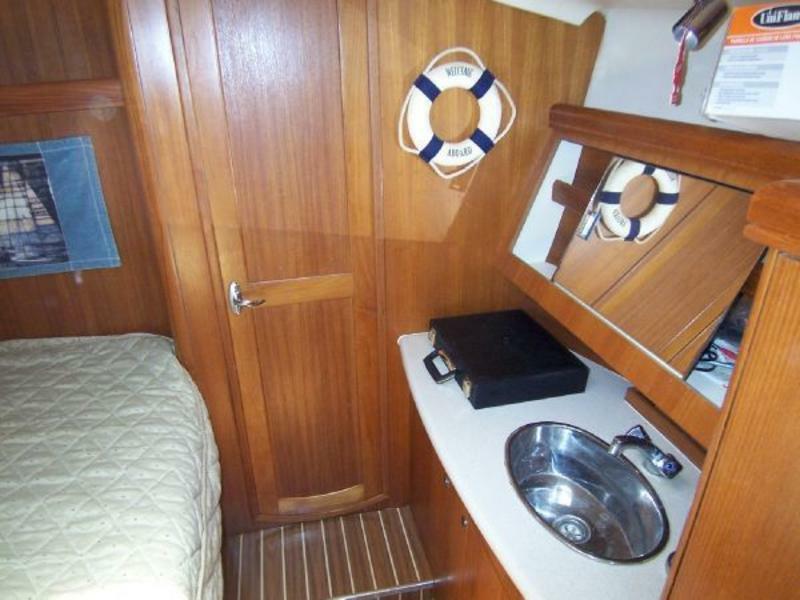 Below decks is accented with abundant use of thick teak fiddles, high gloss laminate teak cabin sole, corian counter tops, accent lighting and rich, warm colors.